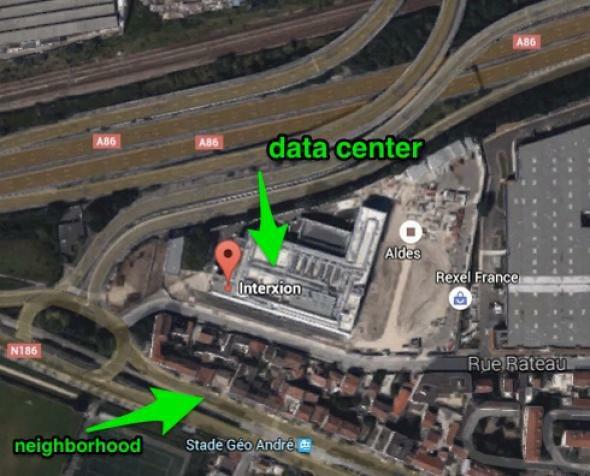 Noise complaints failed to shut down Interxion’s PAR7 data center in La Courneuve, Paris. Maybe not the best community neighbor. You might think of noise complaints as being primarily related to construction or raves. Maybe sometimes there’s a dog that won’t stop barking or a loud ventilation system. But residents in a Paris neighborhood have been dealing with the hum of a cloud computing center since 2012. And they’re not happy about it. Unfortunately, a French court recently shot down their noise complaints. For a little while it looked like residents from La Courneuve, Paris, might win. Last month an administrative court revoked cloud company Interxion’s license for operating its PAR7 Paris data center. But Datacenter Dynamics reports that a new court ruling last week reversed this decision and allowed Interexion to apply for a new operating permit on Monday. PAR7 is an $141 million data center with almost 50,000 square feet of space. ZDNet reports that it has eight diesel generators and houses more than 500 million liters of fuel. Community group Urbaxion ’93 Association argued that PAR7 is an evironmental hazard due to factors like the noise it generates and the fuel it houses on site. But a 2014 noise study commissioned by Interxion may have affected this week’s court decision. The evaluation showed that PAR7 was generating noise within the pre-set limits planned for it before it was built. We all want our photos and documents from the cloud, but local residents are probably not satisfied with that justification.